Hi, Thank you, friends and viewers. 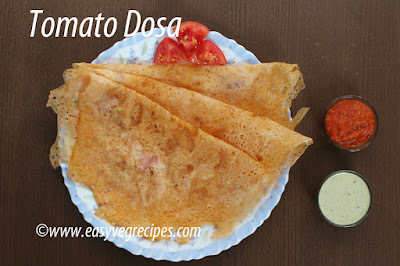 Today I will post how to make tomato dosa recipe. Instant variety of tomato dosa recipe is already there on the blog. This is another variant recipe. This is made exactly or almost like that of neer dosa recipe with a little differentiation, like instead of coconut we add tomato pieces to the batter. Ah!! I have given the gist of the dosa recipe. Still, the detailed text will be given below. This recipe I picked from a youtube channel. The recipe calls for grinding tomatoes with the rice itself, but we can grind it separately. I did like that, first grind tomatoes in the mixer grinder then add the juice to the grinding rice. Grind it to a fine paste. We can grind it in the table-top wet grinder. Meanwhile, grind the tomatoes in the mixer grinder. Sieve it and get the juice. Add the tomato juice to the grinding rice batter. Add salt, chopped onions, green chillies and ginger pieces. Mix it well, make the batter thin enough to pour it on tawa. The batter consistency should be like that of rawa dosa. Heat iron or non-stick griddle, sprinkle some water to check the heat of tawa. Pour the batter with the help of tumbler, in this process we can spread the batter evenly all over the tawa. Add a spoonfull of oil all over the dosa. Cook for a minute, when the dosa edges leave the tawa, slowly lift it with the help of a spatula. Flip the dosa and cook for another minute. Take off from the tawa and serve. Serve tomato dosa with onion chutney and coconut chutney. Thanks for sharing the recipe with us Sailaja. I tried with brown rice...it tasted scrumptious. 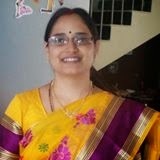 Thanks again, Sailaja.